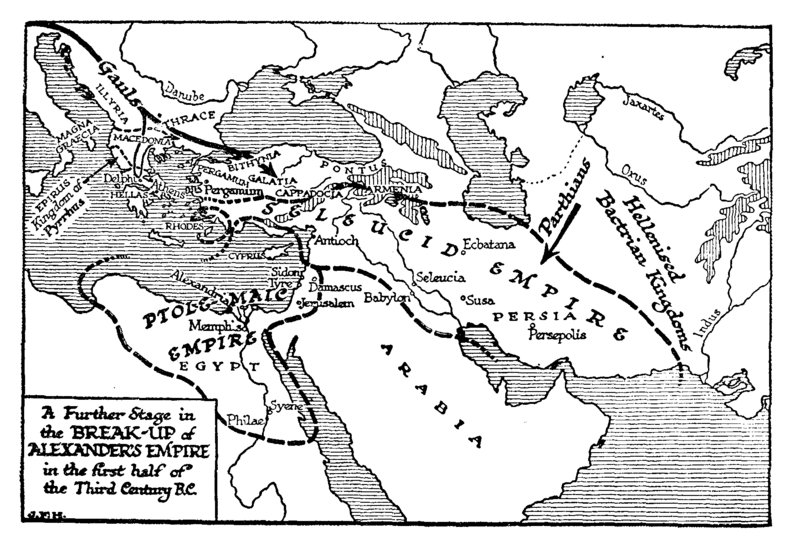 A further stage of the break-up of Alexander’s empire, first half of the third century B.C. Amidst all these shattered fragments of the burst bubble of Hellenic empire one small state stands out and demands at least a brief section to itself, the kingdom of Pergamum. We hear first of this town as an independent centre during the struggle that ended in the battle of Ipsus. While the tide of the Gaulish invasion swirled and foamed to and fro about Asia Minor between the years 277 and 241, Pergamum for a time paid them tribute, but she retained her general independence, and at last, under Attalus I, refused her tribute and defeated them in two decisive battles. For more than a century thereafter (until 133 B.C.) Pergamum remained free, and was perhaps during that period the most highly civilized state in the world. On the hill of the Acropolis was reared a rich group of buildings, palaces, temples, a museum, and a library, rivals of those of Alexandria of which we shall presently tell, and almost the first in the world. Under the princes of Pergamum, Greek art blossomed afresh, and the reliefs of the altar of the temple of Zeus and the statues of the fighting and dying Gauls which were made there, are among the great artistic treasures of mankind. In a little while, as we shall tell later, the influence of a new power began to be felt in the Eastern Mediterranean, the power of the Roman republic, friendly to Greece and to Greek civilization; and in this power the Hellenic communities of Pergamum and Rhodes found a natural and useful ally and supporter against the Galatians and against the Orientalised Seleucid empire. We shall relate how at last the Roman power came into Asia, how it defeated the Seleucid empire at the battle of Magnesia (190 B.C. ), and drove it out of Asia Minor and beyond the Taurus mountains, and how finally in 133 B.C. Attalus, III, the last king of Pergamum, bowing to his sense of an inevitable destiny, made the Roman republic the heir to his kingdom, which became then the Roman province of «Asia».